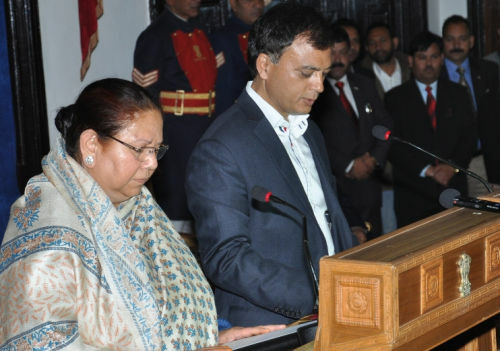 Excise and Taxation Minister Prakash Chaudhry expressed his gratitude to the Chief Minister Virbhadra Singh for presenting a budget that contains the provision for facilitating both dealers and consumers. He said that since Excise and Taxation was a major revenue earning department of the Government, various initiatives and proposals made in the budget would further enhance the revenue of the Government in times to come. Lauding the decision of extending the facilities of filing e- returns, e-declaration, e-tax-payment the Minister said that it would facilitate the business houses and small business establishments to access these services from their shops and offices instead of visiting the Excise Department time and again. He also hailed the proposal made in the budget that from 1st April, the dealers were not required to file hard copies of their monthly and quarterly returns except that of Annual Return, for which they will have to submit the hard copies, thereby saving their time. He said that the dealers would also be intimated the decision through SMS services and e-mail. The Minister also lauded the decision of starting e-services for issue of permits to the Excise licensees in the State so as to facilitate these licensees to get passes at their own premises. He also hailed the proposal of abolishing fee under HP VAT Act, CST Act, Passenger and Good Tax Act and Luxury Tax Act for new dealers to facilitate their early registration. He also lauded other measures in such Taxes so as to simplify the official complexities and help the dealers and Manufacturers in the State. He also welcomed the announcement in the Budget regarding re-constituting and reviving HP Traders welfare Board which would help the traders and businessmen for redressal of their grievances. His colleague Forest and Fisheries Minister Thakur Singh Bharmouri, termed the State Budget presented in the Vidhan Sabha, as a common mans budget dedicated for the welfare of the people of the State. He said that budget had been prepared with great financial prudence keeping in mind the development of all the areas. He said that as many as 1000 thousand families in the State were dependant on fish business for earning their livelihood and due importance had been given to them in the Budget. He welcomed the proposal of starting ‘Backyard Fish Farming scheme’, under which water ponds would be constructed for rearing fishes. He also lauded the decision of providing financial and technical assistance for setting up trout fish farms in the State, adding that a provision of Rs 1.90 crore would be provided for renovation of ‘Inland Fish Landing Centres’ near reservoirs in the State. He hailed the proposal of providing capital outlay of Rs. 422 crore for forest department in the present budget. He also lauded the proposal for treating 5000 hectare of land infested with Lantana Grass so that after removing lantana the same land could be used for planting species of fuel-wood and fodder to restore the productivity of that land. He said that a decision in regard to raise 45 lakh herbal plant species with an outlay of Rs. 10 crore was a welcome decision. In view of the problems faced by people living in wild life or near sanctuaries areas , the proposal in the budget to take out 775 villages from the sanctuary areas was laudable decision which would benefit more than one lakh people. He said that adequate measures had been taken to deal with monkey menace. In the present budget a proposal for opening six new monkey sterilization centres in district Chamba, Sirmour, Mandi, Solan, Kangra and Bilaspur would provide relief to the people from growing population of simians, adding that more fruit plants and edible shrubs would be planted in forest areas so that the monkeys get enough food in their natural habitats and may not head towards villages and townships. He said the farmers would also be encouraged to grow crops as ginger, garlic, turmeric etc. A decision had been taken for maintenance and cleaning of 1000 kilometres fire lines during the current financial year to protect forests fires. He also lauded proposal of devising a policy for collection of spine needles from the forest areas to be utilised in fuel industries and promoting setting up of pine needles based industries.